It was an intense evening at London City Council last night. In the gallery and on the floor, tempers flared, heckling resulted and the gallery was reminded to remain quiet and respectful several times. It is no surprise with two hot issues on the table: Reservoir Hill and fluoridation. The long (and hotly) debated Reservoir Hill vote was first on the agenda. Despite many years of action and pleas to the contrary from a good portion of the public and neighbours of the proposed building site, the vote was passed by a margin of 10-5. This is a decision I truly hope they don’t come to regret in the future, nor do I think we have heard the last of it. Those against the proposed development have vowed to explore legal avenues to have this stopped. If council hoped this vote would put an end to the 20 year battle for Reservoir Hill, I suspect they have another thing coming. The other hot button item on the agenda was the fluoride debate which was “put to rest” by a decision of the same margin (10-5), with council voting to keep fluoride in the water. Also hotly debated, it appeared public response was divided, if not slanted slightly on the side of removing fluoride from the water. Despite the fact it was passed, this issue too will not rest. The fluoride issue will rise again, because there is an increasing number of people who feel the addition of fluoride to our water supply is unnecessary and, perhaps, unethical. My personal feelings on the matter are simple: To be forced against our will to ingest something – anything – that could potentially be harmful is unacceptable. Looking past just the drinking water I consume and to other foods that fluoridated water or additives could be/is present in, I am concerned that we are woefully unaware of just how much fluoride we are consuming in our day to day lives. For example, various bottled beverages, black tea, canned vegetables and meat, and the vegetables we grow that are watered with fluoridated water. How much do you consume in a day? Are you aware of the concentration of fluoride in any of these foods? I didn’t think so, and me either. If you take antidepressants or medications for osteoporosis, fluoride may also be present. The concentrations of fluoride in any of these products we consume may not be known, or readily disclosed. The symptoms of fluorosis – pain in the joints, abdominal pain, nausea, salivation – look like typical complaints we might put down to “getting old” or working too hard. Or perhaps it was something we ate. Ahh, yes, perhaps it was. The fact is, we have no accurate way of gauging how much the average person consumes in a day. So why add insult to injury? Why force the consumption upon us, under the guise of protecting our teeth when topical fluoride is a preferred and safer method of doing so? Anyhow, I won’t go on about that. My opinion is nothing but that – my own – based on the research I have done and the choices I make for my health and well being. There is plenty of research to be found that can assist you in making up your own mind, just as I have, and I highly recommend you seek the information and decide on the matter for yourself. While there is much research to support both sides of the debate – which some feel makes it impossible to decide on which side of the coin they fall – there is also quite a bit of propaganda. 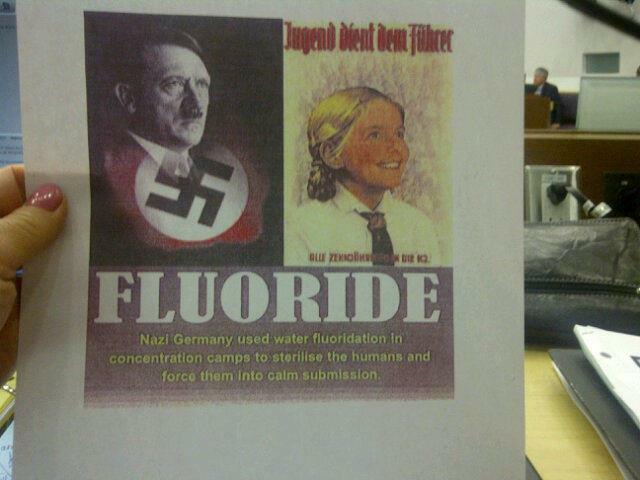 “Nazi Germany used water fluoridation in concentration camps to sterilise the humans and force them into calm submission.”, the paper reads at the bottom. A picture of Hitler is in one corner, and a girl from a Nazi poster with the words “Jugend dient dem Führer: Alle Zehnjährigen in die HJ“*, which translates to, “Youth serves the leader: All ten-year olds into the HJ.” (*Hitler-Jugend or Hitler Youth), in the other. Once again, Councillor, you leave me at a loss for words. Your passion for particular subjects – backyard chickens, the banning of bottled water, the squashing of citizen voices and now, contesting fluoride – is admirable. But I must say, you have an odd way of sharing your ideas at times. This poster is in no way appropriate to distribute to any person, citizen or colleague. Not only is it disrespectful to those who survived the holocaust, it is fear mongering at its worst. As Hitler himself said, “Tell a lie loud enough and long enough and people will believe it.” For as many people who state the claim that Hitler added poisonous levels of fluoride to the water, just as many deny it. Unfortunately, I can’t find compelling or reliable evidence either way to confirm or deny, so reliable sources to either account would be appreciated. The Councillor spoke to the media today and said he sees nothing wrong with the poster. He’s shocked it’s even being discussed, and has no regrets. To the dear councillor I say this: You cannot invoke Hitler without a solid expectation of backlash. You just can’t. Such a tactic to make others see your point of view is unacceptable and completely unnecessary. Do your homework, Councillor, which includes researching all issues placed in the agenda before you, thoroughly and properly. I support your fight to end fluoridation in the water, but I can’t support such methods of presenting your case. Instead a hailing the spirit of Hitler, a properly researched and presented case could have had you hailing victory last night. Perhaps there is a lesson here to keep in mind for the future on how to win people over to your camp. When it comes to propaganda, just say nein.